The heat’s been getting to all of us lately and the only thing actually worth stepping out for is for one of Gurgaon’s many water parks. You get to go swimming and try out a bunch of awesome water rides. Luckily, G-town has some of the best water parks in the NCR, so if you live there, here are a few you can head to. What used to once be Appu Ghar is now Oyster’s Park. Kids or senior citizens, this water park has rides for everyone. With 15 exciting rides, waterslides, an artificial sea wave pool and massages in the cabana, it’s for those who enjoy rides and a chill, rejuvenating vibe. Their massive rides, twisting slides are soothing while we hear the Typhoon and Thunderstorm aren’t for the faint-hearted at all. They also have a long, winding tube tour where you get to go around the whole park. That’s not all. Apart from their thrilling rides, they’ve got a spa, a restaurant, an arcade centre and a bar as well. If you’re looking to spend some quality time with the fam (and have some fun in the water too), this place lets you do both. Everyone’s come here at least once as a kid – the place used to be pretty iconic back in the day. Fun N Food Village has 22 different water slides to pick from in addition to their separate amusement park. They have separate rides for kids and adults and a fun rain dance for everyone to participate in. They have the longest water slide in India and the fastest in Asia. Their amusement park has 21 different rides and they even have a massive indoor snow park. They’ve got a variety of food options inside, so refuel after all that splashing around. 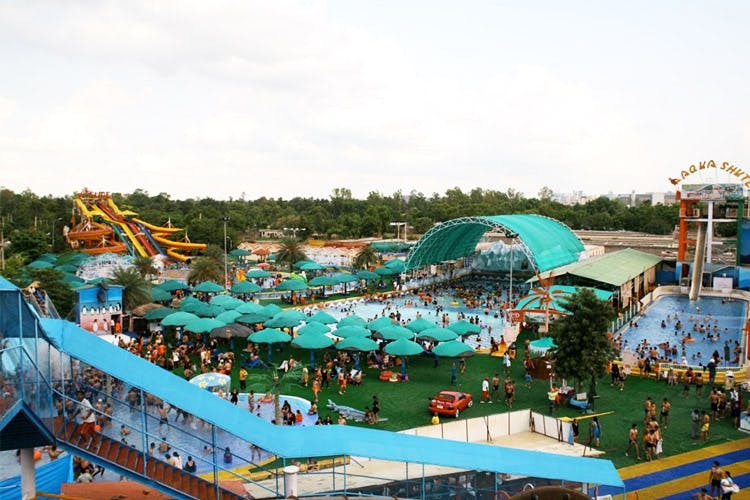 AapnoGhar Resort Water And Amusement Park has everything under one roof. One of the oldest amusement parks in the city, it’s known for its turbo-twister slide and aqua tube slide, water mushrooms and not to forget their giant, tipping bucket of water. If you just want to enjoy the water without any rides, you can chill in their mist pool. They have other stuff like a rain pool and a rain pillar but if you’re tired of all the water splashing, they have some really nice puppet shows. After everything, hit the food court for a hearty meal of bajre and makke ki roti with sarson ka saag. The first water resort in the country, Wet N Wild promises a whole world of water themed fun. The resort is away from the city and that makes for a nice getaway. They’ve got a bunch of really cool water rides here. To begin with, they have five massive pools, water slides for adults and children and a bunch of exciting rides. They have something called the Tornado and the Pendulum (something we’re excited to try out). They’ve got a bowling alley and restaurants at the resort, so you can spend your time here once you’ve had your fill of the rides.